Alright lovelies, I know many have asked about whether I can or not. Well today I am setting the record straight...yes I do :) My motherinlaw taught myself and my sisinlaw a few years back. It has got to be one of the best things she has ever taught me. Some of you have asked for a tutorial, but to be honest I don't think I'll be writing one of those any time soon. Mainly because I don't feel comfortable sharing my knowledge about it yet. I'm not a pro, just an aspiring one. I can share some of my favorite tips and tricks though. I had a bunch of berries I had froze over the summer, last year. These things needed to be used, so I decided to take a few days and can all the jam and jelly I would need for a year. 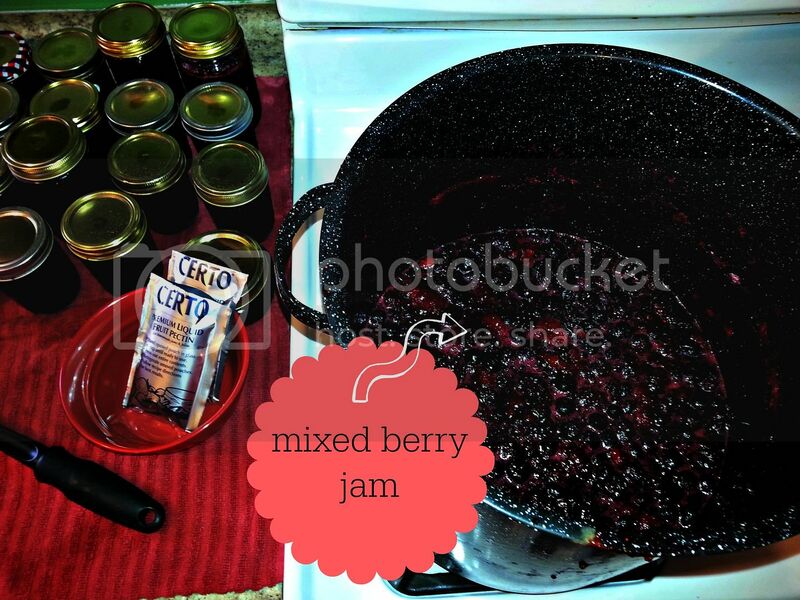 I thawed out all my berries and then used them to make batches of mixed berry jam. I used blueberries, blackberries, and strawberries. I had purchased all of these from Bountiful Baskets and Costco last summer. I bought them when the were at a rock bottom price and then freezed them. It's too hot to can in the summer here...or at least it is for me...so I freeze my berries in the summer and can them in the winter and spring. I know that canning a years worth of something may sound like a daunting task, but it is so wroth it. I ended up doing between 20 and 30 jars of jelly and jams. 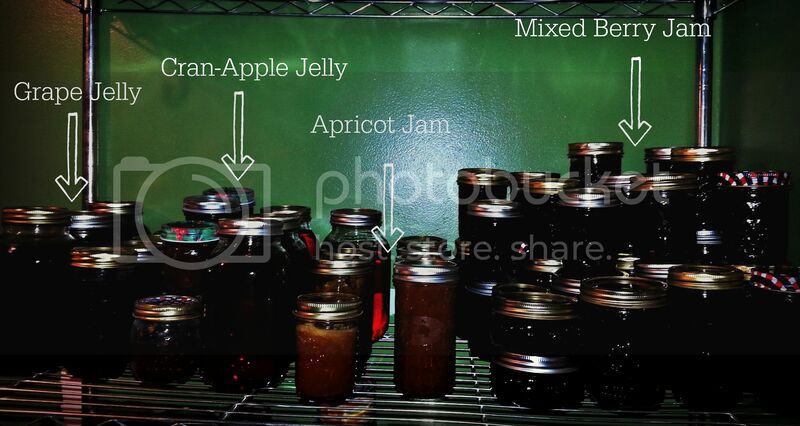 Canning isn't hard, it is just time consuming, which is why I always recommend canning enough for 6 months to a year. This enables you to go longer periods in between canning. My philosophy is if you are going to get out all the stuff, fill that huge pot with water, and take the time...you might as well make it worth it right? When doing my jellies, I use liquid pectin. I use the powdered kind for my jams. 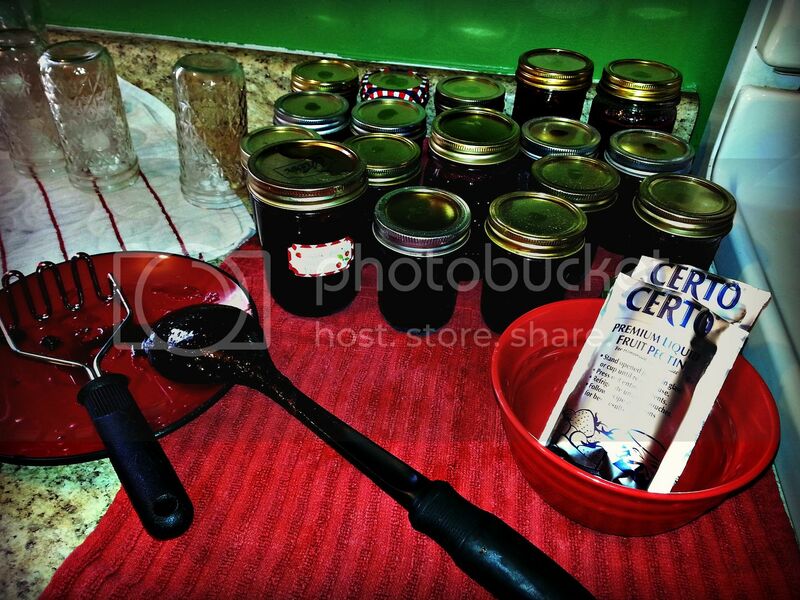 When you water bath your jams and jellies, they will have a store like consistency. Making freezer jams is absolutely easier, but you never get that thick consistency you see with store brands. This is why I water bath my jars. A quick way to sterilize your clean jars is to heat your oven to 220'. Place all your jars, lids, and rings (all separated) into the oven and allow to heat for 10 minutes. You must keep the oven door closed the whole time. Once your ten minutes is up, turn off your oven, and leave your jars in the oven until your ready to use them. This one step is a HUGE time saver. It is much better then boiling each jar in hot water. So there you have it....just a few, quick tips and tricks. I love looking at all these filled jars. It makes me all smiles! I love canning!! 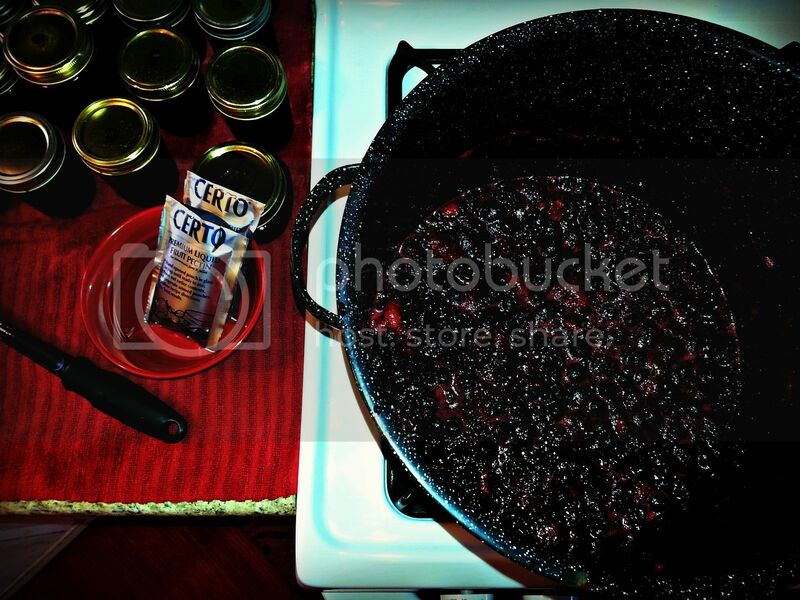 I cannot wait to go pick some berries soon so I can start canning again. I am actually on the hunt from my late grandmother's recipe from cranberry jalapeno jelly, it is amazing on cream cheese as a cracker dip. I'm kind of amazed that you do this. How long does it take to do one recipe from beginning to end? And do you think your mother in law may every be interested in doing a tutorial with you? It seems like canning is a fading art. I'd love to learn more. Awesome idea about using the oven to sterilize. 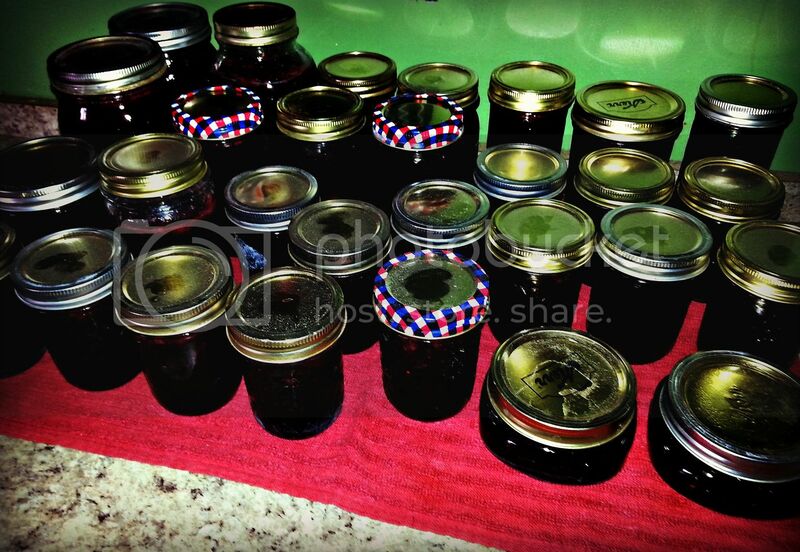 I have only made jam with my mom over 20 years ago and it was more like syrup but still yummy. I have yet to try it on my own although I did do freezer jam (plum). Your jam looks great. I hadn't canned for about 15-20 years until last summer. 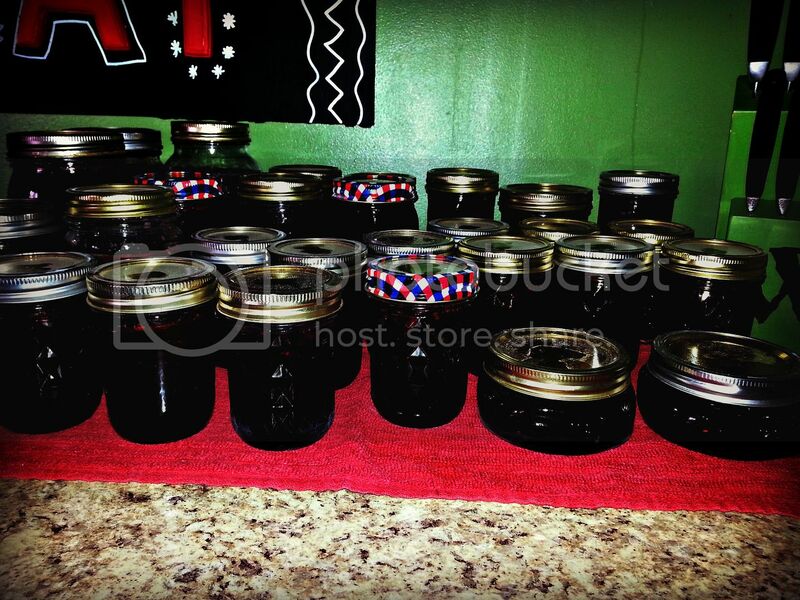 Back then, I mostly only did grape jelly and once I tried apple jelly and both were from store bought juices. I had taken a class a couple years ago from our county extension office to refresh myself, but hadn't applied it until last year when our part of Kentucky had lots of rain. I am blessed with several friends who are wonderful gardeners and always share their bounty when there's extra. With all my windfall, I made salsa, spaghetti sauce, applesauce, apple jelly, apple butter, pear sauce, grape jelly, and blackberry jam. As you can see I also have friends who have fruit trees and grapevines as well. It was so exciting to see the finished product, especially when I had taken it from the actual fruit and cooked it down for the juice to get my jellies. Another reader mentioned a tutorial, I googled "canning" for whatever fruit or vegetables I had and ended up using info from www.pickyourown.org. They had great directions and pictures as well. I would recommend it for beginners. I think just about all my canning recipes came from that site. This year however, I did find a copycat recipe for Prego spaghetti sauce (that's our favorite purchased sauce), that I think I will try, but I was very happy with all the other recipes I used. It has been a lost art somewhat, but I think canning may be making a come back, at least in our area. My new daughter in law is excited about learning to can this summer. And my soon to be daughter in law (yes, 2 weddings this year) wants to make jams and jellies to give away as table favors for guests at her wedding in the fall. I also freeze quite a bit of fruit and vegetables, like corn, squash, onions, peppers, and strawberries. I also froze some of my pears, apples, and blackberries as well. I would like to can some corn this year. I don't have a pressure canner yet to be able to can low acid foods like corn and green beans, but that is on my wish list for this year. I have definitely put my water bath canner to work. I also purchased a Foley Food Mill last year which is mentioned a lot on the pickyourown.org site. I didn't have it in time for my blackberry jam, but it was great for doing my apples last fall when I made apple butter (which I cooked down in the crockpot). Sorry for the long comment, I just get so excited about canning and preserving food these days. I can understand why you love doing it, and it is sooo much better than store bought. I hope you and your family enjoy all your delicious treats on some good homemade bread and biscuits! I use to can many things when my kids were young and I had the time. I got many hours of joy from it and understand your love for it completely. Good luck with the canning they really do put a smile on your face. Can you share the recipe you used for jam? I tried making it last week and got syrup instead of jam.